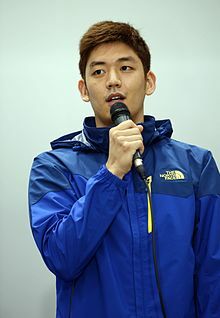 Lee Yong-dae (Hangul: 이용대; Hanja: 李龍大; Korean pronunciation: [i.joŋ.dɛ̝]; born 11 September 1988) is a professional badminton player from South Korea who had been successful in both men's and mixed doubles. He reached world number 1 ranking with 4 different partners, Jung Jae-sung, Ko Sung-hyun and Yoo Yeon-seong in men's doubles, and Lee Hyo-jung in mixed doubles. He won a total of 43 Superseries titles, 37 in the men's doubles, the most of any doubles player in one discipline, and 6 in mixed doubles. He was ranked world number 1 in men's doubles for 104 consecutive weeks with his last partner, Yoo Yeon-seong. After winning the 2016 Korean Superseries with Yoo, Lee announced his retirement from international badminton. In 2018, he repaired with Kim Gi-jung, and won the titles of Spain Masters and Macau Open. Lee started playing badminton at his local elementary school at the age of 8, taking up the sport to lose weight. When he first began competing internationally, in 2003, he was a member of the Hwasun Middle School team, then he was with Hwasun Vocational High School until the end of his junior days in 2006, before joining the Samsung Electromechanics team in 2006. He joined the national badminton team of South Korea in 2003, at the age of 15 years. Lee participated in the OCBC/Yonex US Open, where he played in both the Men's Doubles and Singles category. In both events, he was ousted in the second round. Lee started off 2004 with the French Open International, where he played in the men's singles, men's doubles (with Jung Jung Yong) and mixed doubles (with Kang Hae Won). In the Mixed Doubles event, the pair managed to reach the semi-finals, before losing to the Russians. He participated in several other tournaments without any major results. At the Vietnam Satellite, he reached the quarter-finals in the Mixed Doubles category, partnering Oh Seul Ki. Still struggling to find the right partner, he played several tournaments without getting any big results. However, he did reach the finals of the Cheers Asian Satellite in the mixed doubles and the men's doubles category. With Ha Jung-eun as his partner, he won the Asian Junior Badminton Championships. In July, Lee captured three gold medals at the Asian Junior Championships in Cheras, Malaysia where he played a pivotal role to secure the boys doubles and mixed doubles victories for South Korea and frustrate Malaysia in the mixed team final. In November, Lee made another gold medal hat trick at the BWF World Junior Championships where he led Team Korea to their first world junior championship, never dropping a single set in boys doubles, mixed doubles and mixed team event through the tournament. Lee won the Thailand Open together with Ha Jung-eun; they had a walkover in the final against compatriots Lee Jae-jin and Hwang Ji-man. Together with Hwang Yu-mi, Lee won the mixed doubles tournament. At the Asian Games, Lee and Jung became bronze medalists after losing the semi-finals to Luluk Hadiyanto and Alvent Yulianto of Indonesia in the individual men's doubles event. In the team event, South Korea lost to China in the final 2–3, thus gaining Lee a silver medal. In January, Lee and Jung participated in the Malaysia Open, the first ever BWF Super Series event. There they got through the first round but had to resign from the tournament due to injury. However a week later they blew away competition to take the first prize at the Korea Open. On top of that, Lee also won the mixed doubles with Lee Hyo-jung. Lee and Jung lost to Lee Jae-jin and Hwang Ji-man in the final of the German Open; in mixed doubles Lee and Lee lost to Zheng Bo and Gao Ling of China in the semi-finals. Zheng and Gao went on to win the tournament. At the Swiss Open, Lee and Jung took another title, winning the final in three games. For the rest of the year there were no good results in mixed doubles for Lee, mainly because he didn't participate or played with another partner. In men's doubles, he and Jung were eliminated in a disappointing second round. Lee participated in the 2007 Sudirman Cup with the South Korea team. The team lost to China in the semi-finals with a score of 0–3. In July, after a period of disappointing results in men's doubles, Lee became runner-up with Jung at the Thailand Open, losing to Lee Jae-jin and Hwang Ji-man. Not much later, the pair went on to take the silver medal in the 2007 BWF World Championships. They were defeated in the final by Markis Kido and Hendra Setiawan of Indonesia, 19–21, 19–21. In mixed doubles, Lee reached the third round with Lee Hyo-jung. There they lost to Gail Emms and Nathan Robertson of England in three games. With Jung Jae-sung, the rest of the year also resulted in quite disappointing achievements, as he failed to pass the quarterfinals in any major events, except in the French Open. Lee and Jung there lost to the eventual winners, Cai Yun and Fu Haifeng of China. To start 2008, Lee, together with Jung, disappointingly lost to an unseeded pair in the second round of the Malaysia Open. Mixed doubles went better for Lee and Lee this time, finishing as runners-up. They lost to He Hanbin and Yu Yang of China. In Korea, things went a bit better in men's doubles, achieving a quarterfinal. Lee and Jung lost to runners-up Luluk Hadiyanto and Alvent Yulianto of Indonesia there, but in mixed doubles Lee and Lee won the title against Flandy Limpele and Vita Marissa of Indonesia. More than a month later, Lee and Jung came back with a bang to win the All England Open of 2008, beating Choong Tan Fook and Lee Wan Wah in a thrilling semi-final (coming back from a 16–20 deficit in the third game) and Lee Jae-jin and Hwang Ji-man, also from Korea, in the final. In mixed doubles Lee lost in the quarterfinals to eventual winners Zheng Bo and Gao Ling. A week later, Lee was victorious with Jung in the Swiss Open too. In mixed doubles they lost against He Hanbin and Yu Yang, who went on to the semi-finals. At the Badminton Asia Championships Lee and Jung became winners, beating Candra Wijaya and Nova Widianto of Indonesia in the final. Lee and Jung pair were the only ones to score a point for South Korea against China in the Thomas Cup final, which ended in a 3–1 win for China. Not having participated in the two Super Series events prior to the Olympics, supposedly because of their preparations for the Summer Olympics, Lee was disappointingly knocked out in the first round in Beijing with Jung. However, Lee and Lee upset the badminton world and went on to get the gold medal in mixed doubles, becoming the youngest gold medalists in Olympic badminton. Lee Yong-dae started the year brightly when he and Jung Jae-sung won the Malaysia Super Series. In the Korea Super Series, Lee won the mixed doubles title with Lee Hyo-jung, while he and Jung reached the final. However, as Jung had to join the military service for two months, Lee paired with Shin Baek-cheol for the German Open and claimed the title. In the Swiss Open Super Series, Lee Yong-dae and Lee Hyo-jung reached the mixed doubles final but failed to capture the trophy as they lost to China's Zheng Bo and Ma Jin. A month later, they subdued teammates Yoo Yeon-seong and Kim Min-jung to clinch the Asian Badminton Championship title. In the Sudirman Cup on May 10–17, Lee Yong-dae brought South Korea to the final to meet defending champion China. Lee won in both the men's doubles and mixed doubles events. However, in the final, he and Lee Hyo-jung lost to Zheng Bo and Yu Yang, while a few hours later he and Jung Jae-sung also lost to Cai Yun and Fu Haifeng. China then won the cup for the third consecutive time, 3–0. In June, Lee Yong-dae played in the Singapore Open Super Series, but he did not win any title. In Indonesia a week later, he reached both the finals of men's doubles and mixed doubles event. Again, he and Lee Hyo-jung were defeated by Zheng Bo and Ma Jin, the Chinese pair who beat them in Singapore semi-final. Happily, he took the men's doubles title with Jung Jae-sung, conquering China's top pair Cai Yun and Fu Haifeng. In August, Lee Yong-dae participated in the BWF World Championships in Hyderabad, India. Unfortunately, in the mixed event, he and Lee Hyo-jung, who were the first seeds, lost to Thomas Laybourn and Kamilla Rytter Juhl of Denmark, who later became the champions. He had a better run with Jung Jae-sung in the men's doubles, reaching the final. They met Cai and Fu again, and this time, they lost. In November, after a two-month absence due to injury, Lee Yong-dae returned to play in Hong Kong Open Super Series. Though he and Lee Hyo-jung lost in the first round, he fared better in the men's doubles with Jung Jae-sung. In the final, they defeated Lars Paaske and Jonas Rasmussen of Denmark. Only a week later, Lee successfully defended his two titles in China Open Super Series. He and Lee Hyo-jung beat Zheng Bo and Ma Jin in the mixed doubles final. With Jung, he defeated Koo Kien Keat and Tan Boon Heong in men's doubles final. In December, Lee and Jung participated in Super Series Finals in Johor Bahru, Malaysia. Unbelievably, they did not drop a single set from the group stage to the final. In the final, they outclassed Denmark's Mathias Boe and Carsten Mogensen, whom they had subdued in the group stage. On January 17, Lee Yong-dae successfully started the 2010 year by winning Korea Open Super Series in Seoul with Jung Jae-sung. In the final, the top seeds defeated Cai Yun and Fu Haifeng of China 21–11, 14–21, and 21–18. However, in the mixed doubles, Lee who paired with Lee Hyo-jung were subdued 13–21 and 16–21 by Chinese pair Tao Jiaming and Zhang Yawen in the first round. The same pair defeated Lee and Lee in the second round of Malaysia Open a week later without a match. In March's All England Championship, Lee Yong-dae and Lee Hyo-jung reached the semi-finals, playing Widhianto/Natsir. The third seeds lost to the Indonesian pair 16–21, 21–18, and 8–21. With Jung Jae-sung in the men's doubles, Lee only made it to the quarter-finals, defeated 18–21, 10–21 by Xu Chen and Guo Zhendong of China. Lee Yong-dae and Lee Hyo-jung grabbed their first title of the year in Swiss Open Super Series after subduing compatriots Shin Baek-cheol and Yoo Hyun-young in straight sets, 21–14 and 21–18. Lee Yong-dae was absent from the Thomas Cup due to injury. However, his comeback was successful as he and Jung Jae-sung won the first tournament they played after the injury, Taiwan Grand Prix Gold. The third seeds beat compatriot Cho Gun-woo and Kwon Yi-goo. In the Asian Games in November, Lee Yong-dae and Jung Jae-sung helped South Korea men's team to reach the final. They beat Chinese Cai Yun and Fu Haifeng in the final, yet Korea was failed to win the gold medal as China downed Korea 3–1. For the individual event, Lee Yong-dae and Jung Jae-sung gained the bronze medal after beaten by Indonesia's Markis Kido and Hendra Setiawan in the last four. Yong-dae started the 2011 season with a not-so-satisfying result in the Super Series Finals in Taiwan as he and Jung Jae-sung finished in second. However, their disappointment disappeared after they became the first winner of Korea Open Super Series Premier in January. In the final, they conquered top-seeded Denmark's Mathias Boe and Carsten Mogensen easily, 21–6 and 21–13. With the retirement of Lee Hyo-jung, Lee has now paired with Ha Jung-eun in the mixed doubles. They won the US Open Grand Prix Gold in July with a 21–19, 21–13 win over Taiwan's fifth-seeded Chen Hung-Ling and Cheng Wen-Hsing. The next week, Yong-dae participated in the Yonex Canada Open at the Richmond Olympic Oval. With Ko Sung-hyun, he won the title. However, in the mixed doubles, Yong-dae and his partner, Ha Jung-eun, lost to qualifier Cheng Liu and Luo Ying in the second round. On October 23, Lee Yong-dae and Jung Jae-sung once again defeated Cai Yun and Fu Haifeng 21–16, 21–17 to win Denmark Open Super Series Premier. On October 30 Lee Yong-dae and Jung Jae-Sung were again victorious against Cai Yun and Fu Haifeng in three sets, 14–21 21–15 21–11, to win the French Super Series title. Lee Yong-Dae and Jung Jae-sung didn't start off the year so well with a loss in their home game at the 2012 Victor Open in Korea losing to Cai Yun and Fu Haifeng in three sets, 18–21 21–17 21–19. In German Open, the Lee and Jung reached the final but lost to unseeded Chinese pair, Hong Wei and Shen Ye. However, they managed to win against Cai Yun and Fu Haifeng again in March to win their second All England title with a 21–23, 21–9, and 21–14 victory. In June, Lee Yong-dae and Jung Jae-sung won their second Indonesia Open title after defeating Danish Carsten Mogensen and Mathias Boe 23–21, 19–21, and 21–11. His record against the Danish players was good but unfortunately, in their last meeting in 2012 in the semi final of 2012 Olympic Games was won by the Danish players in 3 thrilling sets, breaking Koreans' hope to take the gold medals. Instead they had to be satisfied with bronze medals. Lee Yong-Dae started the year with his new partner Ko Sung-Hyun winning the Victor Korea Open against Mathias Boe and Carsten Mogensen 19-21, 21-13, 21-10. They then entered the Malaysian Open and placed second losing to Indonesian pairs Mohammad Ahsan and Hendra Setiawan 21-15, 21-13. After the Malaysian Open, the pair failed to perform losing 21-14, 21-14 to Liu Xiaolong and Qiu Zihan of China in the Quarter Finals of the German Open. A week later, the pair lost again in Round 1 of the All-England Open 2013 to unseeded German Pair Ingo Kindervater and Johannes Schoettler 23-21, 21-18. At the India Open in April, the pair lost in the Finals to Liu Xiaolong and Qiu Zihan of China 22-20, 21-18. After a one-year partnership, Lee Yong Dae and Ko Sung Hyun split and Lee paired with current world #8 and Ko's former partner Yoo Yeon-Seong. This partnership won two consecutive tournaments 2013 Denmark Super Series Premier & Victor China Open. In January, Lee Yong-dae and Kim Gi-jung were banned for a year by the BWF from playing any international tournament due to their absence during a drug test. However, after further investigation, the ban was lifted several months later due to lack of evidence and claims that their absence was due to a misunderstanding with the Badminton Association of Korea. Lee immediately returned to the badminton scene in May by contributing to the national squad at the 2014 Thomas Cup. South Korea came in second to Malaysia in the group stage but eventually lost 2-3 to Indonesia in the quarter-finals. In 2014 Copenhagen men's doubles final, Lee and Yoo Yeon-Seong surprisingly lost to their compatriots Ko Sung Hyun and Shin Baek-cheol 20-22, 23-21, 18-21. Therefore, Lee won his third silver medal in world championship. Lee Yong Dae had a bright year in 2015 despite a slow start to the year. He won a total of 6 superseries titles, 4 consecutively, namely Australia, Japan, Korea, Denmark, France and Hong Kong with partner Yoo Yeon Seong, and were top seeds for the Dubai Superseries finals, despite losing to Indonesian rivals Ahsan/Setiawan in the semifinals. Lee Yong Dae and partner Yoo Yeon Seong started off the year at the 2016 German Open Grand Prix Gold and lost to compatriots Ko Sung Hyun/Shin Baek Cheol in the finals. They reached the semifinals at the 2016 All England Super Series Premier but suffered a shock loss to unseeded Russian pair Ivanov/Sozonov, who went on to take their first Super Series title. They also reached the semifinals stage of the 2016 Malaysia Super Series Premier and the 2016 Singapore Super Series, but were knocked out by compatriots Kim Gi-jung /Kim Sa-rang, and Chinese pair Fu/Zhang, respectively. Both pairs went on to win the tournaments. Lee and Yoo won their first title of 2016 at the 2016 China Masters Grand Prix Gold against Kim/Kim, and their second at the 2016 Badminton Asia Championships against unseeded Chinese pairing of Li Junhui and Liu Yuchen. They then contested the 2016 Thomas Cup representing Korea, and won three out of four matches they played, their only loss coming from eventual finalists, Indonesia's Ahsan/Setiawan. Lee and Yoo then won their first Super Series title of the year, and their third in total, at the 2016 Indonesia Super Series Premier, beating China's fifth seeds Chai/Hong in the final. They represented Korea at the 2016 Summer Olympics as the top seeds, but crashed out in the quarterfinals to unseeded Malaysian pair Goh V Shem/Tan Wee Kiong which was their second losses in 9 meetings with the Malaysian pair. Lee announced that he would retire following the 2016 Summer Olympics, with his last tournament being the Korea Open in September in which he won alongside his partner Yoo Yeon Seong against the Chinese Li/Liu pair. Lee's gold medal win at the 2008 Olympics, his first appearance at the Olympic Games, propelled him from relative obscurity to national fame. He has since made several appearances on the sports-themed variety show Our Neighborhood Arts and Physical Education. Lee start dating actress Byun Soo-mi in 2011 and went public with their relationship in 2012. The two met at a badminton event hosted by Byun's father. On February 8, 2017, Lee announced they were engaged and planned to have a small private wedding ceremony. On April 10, 2017, their daughter Lee Ye-bin was born, and her growth is document in the new KBS's reality show Pot Stand, as it was named after the books used to put under the hot pots. The couple decided to write a memoir of their private lives and Ye-bin's growth and development. The BWF Grand Prix has two levels: Grand Prix and Grand Prix Gold. It is a series of badminton tournaments, sanctioned by Badminton World Federation (BWF) since 2007. The World Badminton Grand Prix has been sanctioned by the International Badminton Federation since 1983. ^ "Hwasun Middle School 2003 results". Badminton Korea Association. Retrieved 14 January 2018. ^ "Hwasun Vocational High School 2006 Results". Badminton Korea Association. Retrieved 14 January 2018. ^ Hearn, Don (14 November 2006). "WORLD JUNIORS 2006 – Korea Fights for Three Golds; China Cruises to Two". Badzine.net. Retrieved 14 January 2018. ^ "Samsung Electromechanics Results". Badminton Korea Association. Retrieved 14 January 2018. ^ "Lee Yong Dae Speaks". Badzine.net. December 15, 2008. ^ "[단독] 이용대, 배우 변수미와 결혼…6년 사랑 결실" (in Korean). sports.news.naver.com. February 9, 2017. Retrieved February 10, 2017. Wikimedia Commons has media related to Lee Yong-dae.